The Law on Referendum (the Law), which is the first of its kind in Vietnam, was passed last November, will enter into force on July 1 this year. The Law aims to promote democracy and the role of the people as masters and diversify forms of practicing direct democracy. It creates a solid legal foundation for the people to be directly involved in state governance. Consisting of eight chapters with 52 articles, the Law prescribes principles of referendum; tasks and powers of agencies and organizations in holding a referendum; the order and procedures for deciding on and holding a referendum; and referendum result and its validity. Principles of referendum are specified in Article 4. The first principle is to guarantee the people’s direct expression of their will in deciding on key issues of the country and increase the national great unity and social consensus. The second is to ensure universal, equal and direct suffrage and secret ballot at referendum. The third is that a referendum must be conducted according to the order and procedures prescribed by the Law. On the basis of the provisions of the 2013 Constitution, the Law stipulates that referendums must be held on a national scale. - Other extremely important issues of the country. The Law also prescribes cases of non-organization of referendum. Accordingly, no referendum will be held again on the same issue which has been put to referendum within 24 months after the referendum result is announced. A referendum will not be held when a nationwide state of war or state of emergency is declared or within six months after such state is lifted. The National Assembly will consider and decide to hold a referendum. The National Assembly Standing Committee, the President, the Government, or at least one-third of the total number of National Assembly deputies may propose the National Assembly to consider and decide on a referendum. The National Assembly Standing Committee will decide on the date of referendum, which must be a Sunday and announced at least 60 days in advance. 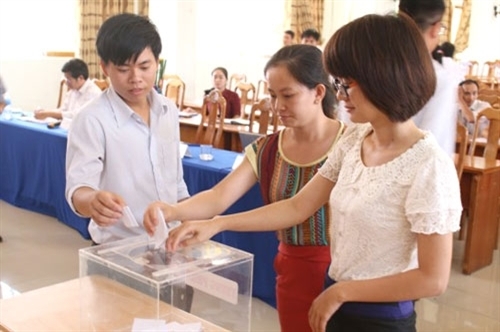 Vietnamese citizens who reach the age of 18 by the date a referendum is held by the State have the right to cast votes in the referendum. The National Assembly and its agencies and deputies and local People’s Councils and their standing bodies and boards and deputies will oversee the organization of referendum. The Vietnam Fatherland Front and its member organizations and the people will also do it. Under the Law, a referendum will become valid only when at least three-fourths of voters named on the list of voters cast their votes. An issue put to referendum will be valid for implementation when it is voted for by more than half of valid ballot papers. Particularly, a constitutional issue put to referendum must be voted for by at least two-thirds of valid ballot papers. After receiving and examining reports on the referendum result of provincial-level People’s Committees and settling complaints and denunciations, if any, the National Assembly Standing Committee will adopt a resolution ascertaining the referendum result. This resolution must be announced within 15 days after the date of the referendum or the date of revoting, in case of revoting. The National Assembly Standing Committee will report on the referendum result to the National Assembly at the next session.